b.h. Yael is a Toronto based artist, working in documentary and experimental media and installation. 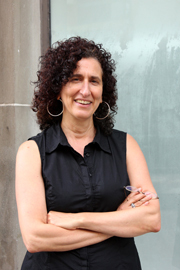 She is Professor of Integrated Media at OCAD University. Yael’s work has exhibited nationally and internationally and has shown in various settings, from festivals to galleries to community and activist groups and various educational venues. Yael’s work has dealt with the many intersections of identity (Fresh Blood); it has focused on activist initiatives in Palestine/Israel (Palestine Trilogy); and more recently addressed apocalypse and environmental issues (Trading the Future.) Yael is currently working on a Canada Council funded video project, Lessons for Polygamists, which incorporates personal narrative and animation into a collage aesthetic. Yael has served on the boards of Images Film Festival and the Canadian Filmmakers Distribution Centre, and is currently the Chair of the Board of Wychwood Open Door, a community drop-in for homeless and socially isolated individuals. She has served on numerous juries and awards committees from film & media festivals to all three levels of public arts funding.